1. Spectral interferometer which is based on recording the reflectance spectrum from a central point on the cornea. Constructive and destructive interference between reflections between two surfaces (e.g., the anterior and posterior surfaces of the tear film) cause, respectively, maxima and minima in the reflection spectrum, which can be used to calculate the distance between the two surfaces (e.g., tear film thickness). 2. Low resolution color microscope based on a design by Dr. Marshall Doane, which covers an area of 6 mm diameter. This is used to image the superficial lipid layer of the tear film whose reflectance and color are determined by lipid thickness (like the colors on an oily puddle). Use of a stroboscopic light source and video rates up to 67 per second allow detailed study of the blink process. 3. 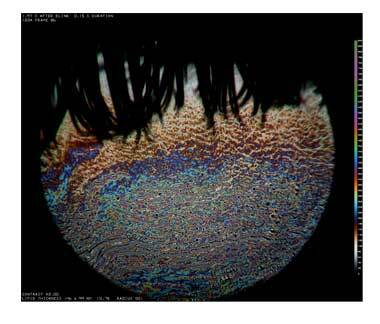 High resolution color microscope is also used for imaging the lipid layer, using a stroboscopic light source. It uses a long working distance microscope objective of high numerical aperture (0.6) giving a lateral resolution of about 1 mm. Because the depth of focus is very small compared to eye movements along the optical axis, 2000 images are recorded on a video camera with the intention that a limited number (e.g. 10) will be in good focus. 4. Fluorescence imaging system (used after instillation of fluorescein) which covers the whole exposed cornea and part of the conjunctiva. A novelty of these studies is the use of fluorescent “quenching” which greatly reduces fluorescent efficiency at high but not low fluorescein concentration. Evaporation causes increased fluorescein concentration and so reduces efficiency for high but not low fluorescein concentrations. Therefore, by comparing recordings using high and low fluorescein concentrations, the relative contributions of evaporation and “tangential flow” (along the corneal surface) to tear film breakup and thinning between blinks can be studied. 5. Lipid layer and fluorescence imaging system. After instillation of fluorescein, simultaneous lipid layer and fluorescence images are recorded with a video camera. In this way, the relation of breakup and fluorescence dimming after a blink (e.g., due to evaporation and quenching) to lipid layer structure can be studied. Dr. King-Smith's education was in physics (Ph.D., Cambridge University) and physiology (M.Sc., University College, London). 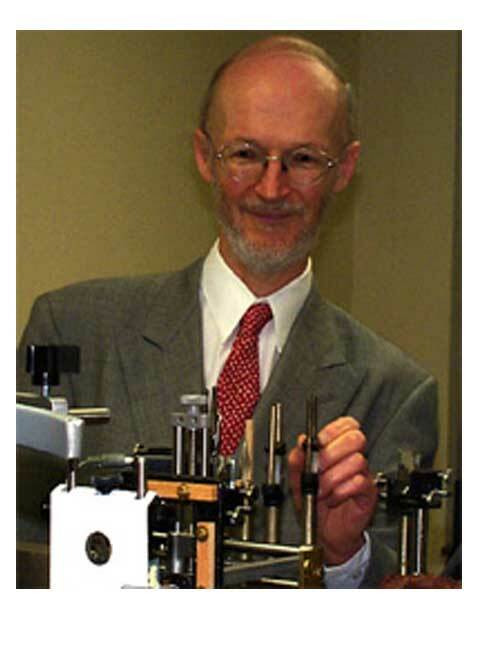 His post-doctoral studies in electrophysiology and retinal densitometry were at Edinburgh, Oxford and Florida State Universities. He then joined the faculty of the Optometry Department at the University of Manchester, after which he moved to the Ohio State University College of Optometry in 1980. Initially, he worked mainly on normal and clinical psychophysics including analysis of visual sensitivity in optic nerve disorders in terms of selective loss of different types of ganglion cells. Later, he also worked on methods for measuring visual thresholds, methods for scoring color vision tests and the electroretinogram. Since 1995, he has mainly been working on optical studies of the tear film with an aim of studying tear film structure, and mechanisms of tear film breakup and thinning between blinks. Studies using optical interference and fluorescence quenching can provide unique information about the role of important factors such as evaporation, osmolarity, osmotic flow through corneal and conjunctival surfaces, and tear flow along the corneal surface. Increased evaporation through the lipid layer is a key mechanism of dry eye disorders. He has also been involved in modeling the tear film lipid layer, including comparison with other biological barriers to evaporation such as the lipid layers in the skin.